eLearning professionals are rapidly adopting Easygenerator, an online free authoring tool. 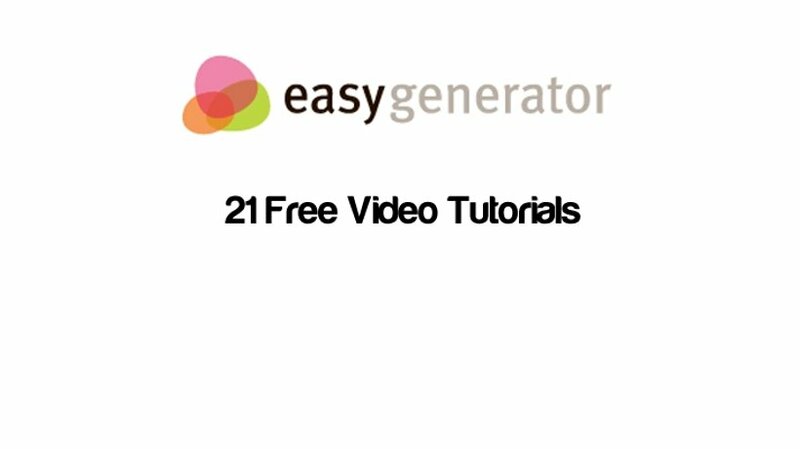 This is why we created a collection of Free Easygenerator Video Tutorials! VivaeLearning! Easygenerator is an online free authoring tool. Easygenerator is a Windows application that stores all content in the cloud, securely on their webservers. Part of the free edition includes hosting, updates, upgrades, and maintenance. There are no technical worries and no costs. With your free authoring eLearning software you can have as many as 10 eLearning courses in your online workspace, and up to 250 MB of data storage per user. You can import PowerPoint presentations (text and images) and build real eLearning courses from them. At the top of the list are the most recent Easygenerator Free Video Tutorials. We highly encourage you to help us build the Largest Collection of Free Easygenerator Video Tutorials by Joining for Free Viva eLearning! If you would like to stay updated about new free video tutorials join Viva eLearning Mailing List! Changes in the Layout without effecting your original page e.t.c. You can copy a page easily with a specific option. How navigation in easygenerator can work based on the outcome of a question or assessment. You have the ability to create navigation rules. A written statement describing specific, attainable and measurable achievements that you want to accomplish during your work term.